World War II was waged on land, on sea, and in the air over several diverse theaters of operation for approximately six years. The following essay on the wartime mobilization effort supplements a series of studies on the Army's campaigns of that war. On 7 December 1941 Japan turned its war on the Asian mainland south and eastward into the Pacific. Attacks within hours on the Malay Peninsula, Hong Kong, Hawaii, Wake, Guam, and the Philippines not only shocked Allied governments, who believed Japanese envoys had been negotiating in good faith in Washington, but also caught them poorly prepared for war along the Asian rimlands. By the end of the day a sizable Japanese amphibious force had established itself on the Malay Peninsula; the backbone of the U.S. Pacific Fleet lay twisted and burning in the mud of Pearl Harbor; hundreds of Western aircraft sprawled crumpled on airfields and hillsides across the Central and South Pacific; and neither the British Eastern Fleet nor Royal Netherlands Navy units in the Pacific could steam safely through the Indian Ocean, around Malaya, or in the East Indies. 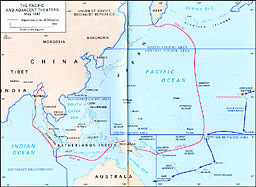 It was imperative that the Western Powers somehow stop the Japanese southward advance, which now threatened to drive a wedge between the British in the Indian Ocean and the Americans in the Pacific, to seize the East Indies with its valuable natural resources, and to isolate Australia from both the United States and the British Commonwealth. In the half century before 7 December 1941, Japan had built a powerful army and navy and dramatically extended its control in Asia with startling victories over China in 1894 and Russia in 1905. During the Great War of 1914-18, Japanese influence in the Pacific increased, this time with the aid of the Western powers. At the Versailles Conference, the victorious Allies assigned Tokyo a mandate over the Marshall, Mariana, and Caroline archipelagos in the Central Pacific. Under the League of Nations, which Japan joined, powers holding such authority agreed to act as guardians of resident peoples while neither exploiting resources nor fortifying territories. hand. Anxious for a firsthand view of Japanese activity in the mandates, in 1923 the U.S. Navy sent Marine Lt. Col. Earl Ellis to reconnoiter the area; Ellis was captured by the Japanese and died under mysterious circumstances. Despite growing suspicion of Japanese motives in the Pacific and on the Asian mainland several major Western Powers continued giving Japan vital economic and military assistance long after the Versailles Conference. As a result of the Anglo-Japanese Treaty of Alliance signed in 1902, British aviation instructors served at Imperial Army and Navy schools until 1923. In addition, the major Western powers opened their military schools to Japanese student-officers and many of their bases to Japanese attaches and visitors. More important, until only months before hostilities began in 1941, the West continued trading with Tokyo, exporting a wide range of products and commodities, including coal, oil, and steel, all essential to resource-poor Japan. For most in the world Japan's ratification of naval limitation treaties in 1922 and 1930 seemed justification enough for such policies. Beginning in 1928, ignoring or explaining away Japanese belligerence became increasingly difficult. That year Imperial Army officers stationed in Manchuria assassinated the Chinese warlord Chang Tso-lin. During the 1930s further assassinations by right-wing nationalists claimed the lives of two Japanese prime ministers and many other key officials, leading to increased military influence in Japanese foreign policy. In 1932 the Kwantung Army, Japan's garrison force in Manchuria, set up the puppet state of Manchukuo. The next year the League of Nations labeled Japan the aggressor in Manchuria; in response Tokyo announced it would withdraw from the League, ignore naval limitation treaties, and bar third-country access to the mandated islands. 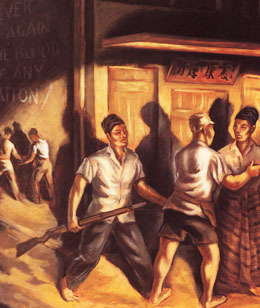 In 1937 Japanese and Chinese troops exchanged gunfire near Peking. The so-called "Marco Polo Bridge incident" quickly escalated into an all-out war between China and Japan. Alarmed by Japanese aggression in Asia and the fall of France to Nazi Germany in 1940, President Franklin D. Roosevelt authorized liaison between American and British military staffs in early 1941 to discuss possible responses to aggression in the Atlantic and the Pacific. To disguise their purpose at a time of official American neutrality, British officers involved in these talks described themselves as "military equipment purchasing agents." A delegation of seven British army and navy officers came to Washington to meet the same number of American officers in the American-British Conversations, or ABC meetings. ABC conferees enjoyed maximum candor but minimum authority: they could raise any issue but nothing they agreed upon obligated their governments. Meeting fourteen times between 29 January and 29 March 1941, the two staffs discussed their strategic priorities. The two sides summarized their views in a two-part report, ABC-1 and ABC-2. Major points of agreement included a commitment to make the security of the Western Hemisphere, the Atlantic trade routes, and Great Britain itself the paramount American objective. The major share of American aircraft production would go to the British until the United States became involved in hostilities. The geographic implication of the agreements committed the United States and Britain to the defeat of Germany and Italy before Japan. The two sides left one major Pacific issue unresolved: the role of Singapore in Pacific strategy. The British had invested Singapore with not only strategic value as a naval base but also great symbolic value as the center of cohesion for Far Eastern members of the British Commonwealth. The Americans, in contrast, viewed the island base in much the same way as the Philippines: its loss would be a heavy blow, but one from which the Allies could recover. The American side also worried that British strategy and symbolism actually masked a desire to use American resources to defend British colonies. If widely shared this suspicion could only weaken the incipient Western alliance. The broadly stated priorities of the ABC meetings formed the basis for continued American-British strategic planning and suggested the character of United States military operations. As soon as President Roosevelt accepted ABC-1, Army and Navy staffs began work on a more specific plan. In less than a month the commander in chief had the result: Operations Plan RAINBOW-5. Like ABC-1, RAINBOW-5 oriented the U.S. armed forces toward Europe, which for the Army meant planning a force buildup in the United Kingdom. Elsewhere, RAINBOW-5 assigned the Army prodigious tasks to perform with scanty resources. It was to bar Axis influence from the entire Western Hemisphere, which included the Pacific Ocean west to Hawaii. 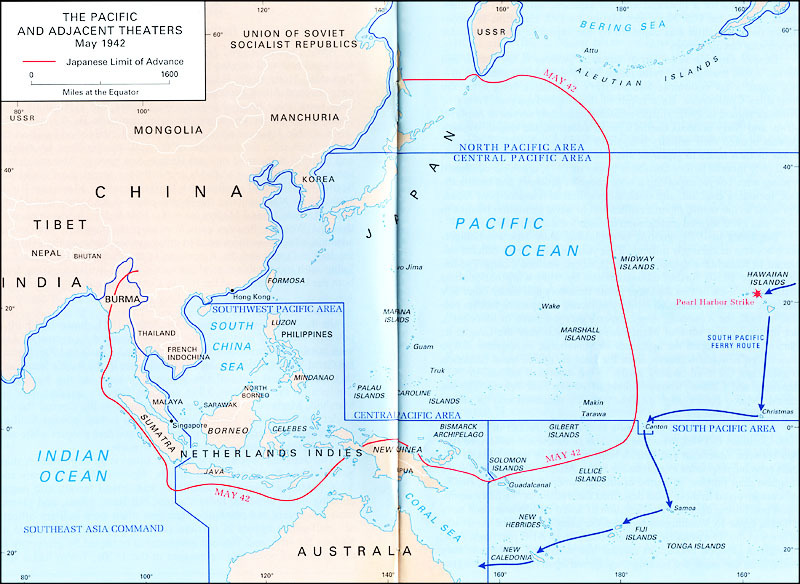 In the rest of the Pacific, the Army was to protect the territory of the "Associated Powers" (Britain, the Netherlands, and the United States) and support naval forces in the defense of sea communications and coastal frontiers. To carry out these missions over vast insular areas, the Army had but 25,000 troops in Hawaii, as well as 9,800 regulars and 12,000 Philippine Scouts in the Philippines. (ABD) talks gave new participants the chance to present views, they failed to live up to their promise. Neither of the two major British proposals--holding Singapore at all costs and building up the Philippines as a base from which to launch air and submarine raids against Japanese targets evoked any enthusiasm from the American side of the table. Aid of any substance to the oil-rich Netherlands East Indies also seemed out of the question. Unable to agree on much more than continued assistance to China, the delegations returned to their respective headquarters. Meanwhile, without waiting for another Allied conference, the Americans went ahead with a deployment of their own. In support of the Europe-first orientation of ABC-1, the U.S. Navy transferred one-quarter of the Pacific Fleet to the Atlantic. While Associated Powers conferences continued, several important events occurred. In March 1941, well prior to the Pearl Harbor attack, the U.S. Congress had passed the Lend-Lease Act, greatly accelerating the flow of supplies and equipment to the Allied powers. To process these transfers to Britain and later Russia, the War Department established military liaison missions which, for the present, ensured even closer American-British military cooperation before a declaration of war by Washington. In June the German invasion of Russia underlined the Allied Strategy's Europe-first orientation, but one month later an event in the Pacific forced an adjustment in American thinking. Japan's demands on French Indochina brought a quick response from President Roosevelt: the president halted all oil shipments to Japan, froze Japanese assets in the United States, and created a new command in the Philippines to discourage further Japanese aggression--United States Army Forces in the Far East (USAFFE) under General Douglas MacArthur. General George C. Marshall, the U.S. Army chief of staff, clarified the new decision to reinforce the Philippines by saying it would "not . . . jeopardize the success of the major efforts made in the theater of the Atlantic." In 1941 the United States thus found itself in the awkward position of supporting a Europe-first strategy while at the same time strengthening its forces in the Pacific. Philippines and Borneo. In general, the British had most of the larger ships, including the only battleships and the lone aircraft carrier; the Dutch and Americans fielded mostly smaller vessels such as destroyers and inshore patrol craft. The Western navies came closest to matching Japanese strength only in submarines, with twenty-eight American and fifteen Dutch, though most predated the Washington Naval Limitation Treaty of 1922. The bulk of the U.S. Navy, in fact, would remain in the eastern Pacific, defending the North American coastline. On land the Associated Powers had a large number of small garrisons and strongpoints most too isolated to assist one another. From Singapore, Lt. Gen. Arthur E. Percival commanded the largest force, a British-Indian-Australian corps of 65,000 on the Malay Peninsula. Along the 2,000-mile length of the East Indies archipelago, small outposts dominated. With three of its four divisions reinforcing British Commonwealth troops in the Mediterranean, the Australians could spare only one battalion to guard Rabaul and two others to reinforce the Dutch at Amboina and Timor. 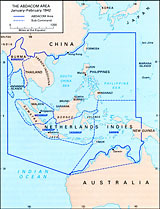 The Dutch Army stationed 25,000 of its own troops, as well as a larger number of underequipped and undertrained colonial troops, at four points on Java. The United States Army had its own garrison and American-trained Philippine Scouts, together just over 21,000 men, in the Philippines. None of these national contingents exercised any more than local influence, and all depended on tenuous logistical links with distant economies. The weakest component of Western defenses was air power. Although the total number of planes in the national contingents--over a thousand--looked impressive on paper, all fell into the category of obsolescent. From their aircraft carriers the Japanese could launch hundreds of faster, more maneuverable, and better-armed planes than the Associated Powers could. To minimize the technological imbalance, the American-British-Dutch-Australian (ABDA) powers would have to put in the air twice as many pursuit planes as the Japanese--an impossible task given competition for resources from the Atlantic and Mediterranean theaters. The disparity of naval forces also illustrated the enormity of the challenge Japan posed to the Associated Powers in the Western Pacific: 94 Allied warships to 230 Japanese. Given this disparity of forces and Allied mission priorities, the fact that the U.S. Army was ultimately able to deploy a few combat units to the Netherlands East Indies was in itself remarkable. in planning but in combat operations as well. Undisguised strategy conferences at the highest political levels replaced surreptitious military staff meetings. Prime Minister Winston Churchill and his military chiefs of staff arrived in Washington on 22 December, and the next day the British leader and the American president began a series of war plans meetings. Collectively referred to as the Arcadia Conference, these sessions hammered tentative views aired at the ABC meetings into decisions reflecting the urgency of the new situation. Roosevelt and Churchill held to the Europe-first orientation of earlier discussions and planned deployments of U.S. Army Air Forces (AAF) squadrons to England. Since the event that formally brought the United States into the war occurred in the Pacific, a new emphasis on that theater appeared in strategic decisions of the Arcadia Conference. To prevent the fall of Burma, Singapore, and the Philippines, as well as the Netherlands East Indies and Australia, the conferees formed a new international command, the American-British-Dutch-Australian Command (ABDACOM), during the last days of 1941. Operational from 15 January 1942, the combined headquarters would answer to a new British-American military committee formed in Washington. The Allies named British Lt. Gen. Sir Archibald Wavell commanding general, with American Lt. Gen. George H. Brett as his deputy. British Air Marshal Sir Richard Peirse commanded its air components, and American Admiral Thomas C. Hart headed the combined navies. However, British, Dutch, and Australian officers at the various garrisons or islands retained their commands and there was little operational unity. ABDACOM boundaries enclosed an enormous expanse of land and water: Burma, Malaya, Okinawa, Formosa, the Philippines, the Netherlands East Indies, New Guinea, the Solomons, New Hebrides, Fiji, New Caledonia, New Zealand Tasmania, and the northern coast of Australia. Providing real unity to all these scattered and diverse forces would prove an impossible task. On 3 January 1942 the British-American Combined Chiefs of Staff informed General Wavell of the basic strategic concept of ABDACOM in a statement appended to their declaration of war aims. For the present the Allies desired to block further southward expansion of Japan. To accomplish this objective, ABDACOM was to "maintain as many key positions as possible" and once the Japanese advance had been blunted to "take the offensive at the earliest opportunity." Pacific to the islands of the East Indies, New Guinea, and the Solomons. With Japanese forces advancing southward ABDACOM frantically transferred units to the Western Pacific. The Australian government secured permission to retrieve its three divisions from the Middle East in February and March. A British division and an Indian brigade joined the garrison on Malaya in January, with a British armored brigade scheduled to augment the same command the following month. Fortunately for ABDACOM, the U.S. Army had some units already in the Pacific to strengthen the new command. Just before the Japanese struck Pearl Harbor, the Army had dispatched a seven-ship convoy to the Philippines. Known as the Pensacola convoy after the escorting cruiser, the task force changed course, and on 22 December disembarked 4,600 air corps and artillery troops at Brisbane, Australia. On 5 January the main unit of this force, the 26th Field Artillery Brigade, moved to the port of Darwin along the northern coast of Australia. There it divided into regiments and battalions for placement at various points along the Malay Barrier defense line, one regiment remaining at Darwin, the rest of the brigade awaiting transfer to Timor and Java. By the time Japanese forces closed in on the Netherlands East Indies, one American battalion--the 2d Battalion, 131st Field Artillery--would be deployed along this central portion of the Malay Barrier. long enough for the productive potential of the United States to fill the Pacific ferry route with men and arms, ABDACOM stood a reasonable chance of containing Japanese aggression in the Western Pacific. But this effort would involve wrenching changes in American planning. Only a few months before, the secretary of war and Army chief of staff had told the president that American field forces would not be ready for "ultimate decisive modern combat" until July 1943. Despite this judgement, General Marshall approved further reinforcements for ABDACOM. Although the air defense of Malaya was left to the Royal Air Force (RAF), he agreed that the AAF could augment Dutch squadrons on Java. During December and January some 300 pursuit planes arrived in the southwest Pacific, part of the diverted Philippines reinforcement. Marshall also planned to ship another 340 planes, making a total of 640 P-39 and P-40 fighters available to ABDACOM. As for ground forces, the Army assembled a 16,000-man task force of one reinforced infantry brigade plus service troops under the command of Brig. 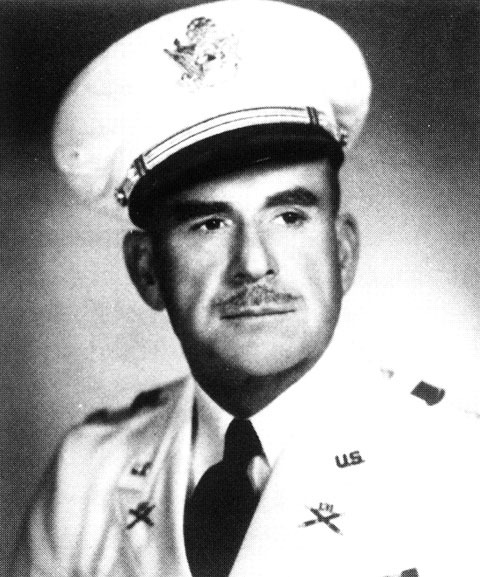 Gen. Alexander M. Patch. Aboard transports from several nations, Patch's task force left New York on 22 January. By 15 January General Wavell had established his headquarters on Java. The British general regarded the security of Burma and Australia to be critical, and viewed the hundreds of islands in between those geographic ends of his command as expendable bases for delaying operations. 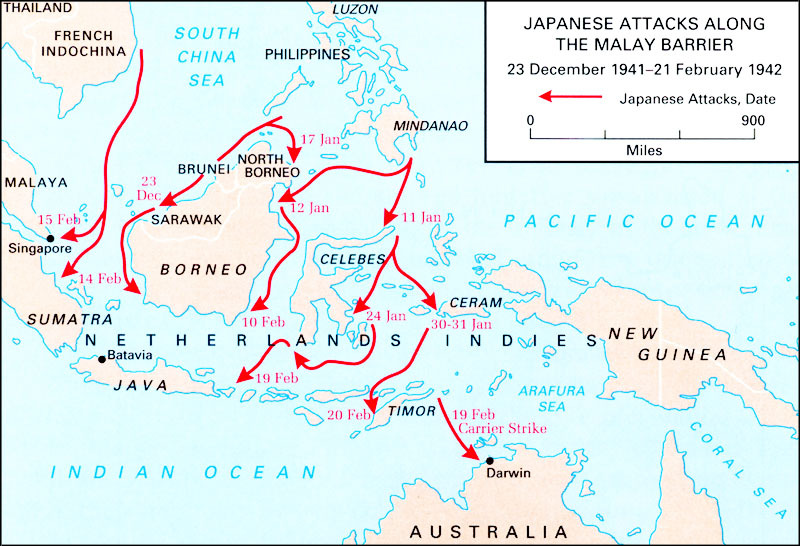 But the Japanese advance through Malaya and into Burma proved irresistible. Then, in the second week of January, the Japanese staged several landings in Borneo and Celebes; on 23 January they also took Rabaul from the Australians. By the end of the month they had moved down the Malay Peninsula, pushing British Commonwealth forces onto the island of Singapore. ABDACOM appeared unable to hold any of its broad defensive perimeter. With his forces reeling before the Japanese, Wavell fought against time to hold the territory. The retreat from Malaya forced a rediversion of a British armored brigade and two Australian divisions from their movement to the Netherlands East Indies. Though he probably knew it was too late, he ordered the British armored brigade to Burma. At about the same time he reported the untenable position ABDACOM faced and advised that the Allies should be prepared to accept the loss of Sumatra and Java. Pacific duty. Although well intentioned, these preparations came too late. Two days after the 41st Infantry Division was alerted, General Percival surrendered Singapore and 64,000 troops with all weapons. The shock in London was severe. Prime Minister Churchill termed this loss "the worst disaster and greatest capitulation of British history." Bali, just east of Java. The next day Japanese troops landed on Timor, only 300 miles from Darwin, and Australia braced for invasion. Japanese air raids against Java alarmed the Americans not only because they increased the danger to Australia but also because U.S. Army units--both air and ground--were part of the Allied defense force there. While the Japanese bombed and strafed Java, Wavell tried to send more American planes to reinforce Dutch pilots. In late January and February five groups of planes took off from Darwin, bound for airfields on Java. Only the first, with thirteen planes, arrived safely. Inclement weather and Japanese fighters eliminated most of the rest. No more than twenty-five P-40s made their way to Javanese airstrips. For American ground troops on Java--a battalion of the 131st Field Artillery--each passing day brought more discouragement. 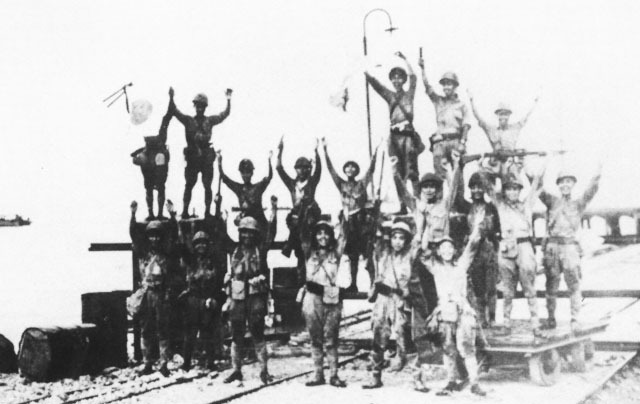 The Japanese 2d Division celebrates landing at Merak, Java, 1 March 1942. As they watched Allied planes fall from the sky in flames, they also saw their line of resupply and reinforcement growing weaker. At the end of February the string of local setbacks added up to a theater disaster. On the 25th General Wavell disbanded ABDACOM headquarters. Although a clear sign of Allied willingness to abandon the theater to the enemy, this development did not mean an end to all Allied operations. ABDA naval forces and the few remaining aircraft patrolled over and around Java in an effort to discover and break up the Japanese amphibious fleet they all knew was coming. They occasionally sank or crippled Japanese vessels but, with air support virtually nonexistent, these forces could do no more than delay the enemy advance. During the last two days of February, Japanese air and naval forces cleared the seas of Allied ships. In the battles of the Java Sea the USS Langley, carrying forty P-40s to Javanese airfields, went down, and the crew of the Sea Witch threw overboard twenty-seven more P-40s to keep them out of enemy hands. Elsewhere in waters off Java, five Allied cruisers and six Allied destroyers fell victim to Japanese air and sea power, and the remnants of the ABDA navy scattered to Ceylon and Australia. Regiment landed at Eretenwetan, 140 miles to the east; and the 48th Division and 56th Regimental Group debarked at Kragan, 400 miles east of Bantam Bay. Their points of invasion made clear the Japanese tactical concept: a double envelopment of the Bandung-Batavia area by the first two units while the last two prevented reinforcement from the east. With the coming of daylight a few old Australian planes rose to contest the landings but could not slow the enemy. For their defense of Java, ABDA officers had divided the island into four area commands, the largest of which amounted to only two regiments, and a mobile strike force. The last, an ad hoc brigade-size unit, had the mission of reinforcing area commands wherever the Japanese struck. Known as Black Force after its commander, Australian Brig. Gen. A. S. Blackburn, the strike force included machine gunners, infantrymen, engineers, tankers, artillerymen, signalmen, medics, truck drivers, clerks, and downed airmen. Black Force also included the only American ground unit on Java, the 2d Battalion of the 131st Field Artillery. 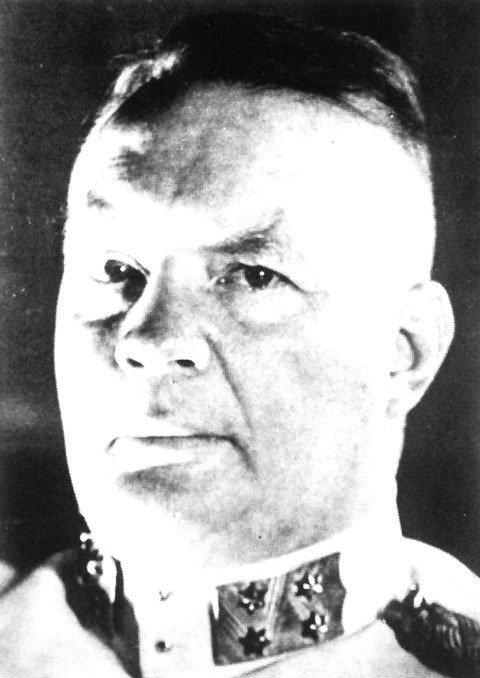 Dutch Lt. Gen. Hein ter Poorten commanded all Allied units still able to defend the island. 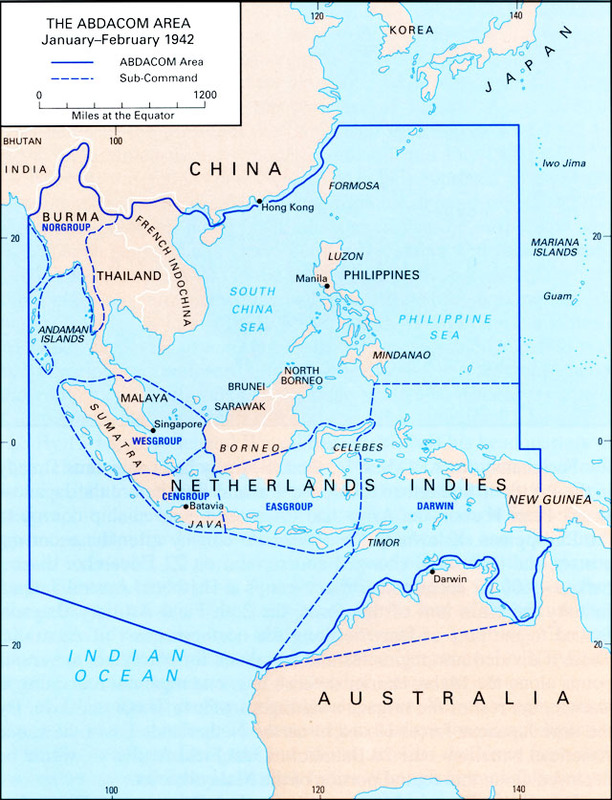 Obviously desperate, with no hope of air or naval support, General ter Poorten planned a fighting withdrawal to protect the Dutch political centers at Batavia, on the north coast, and Bandung, fifty miles inland. In support of this concept, ter Poorten concentrated his four-nation force in the west. Buitenzorg, and the Tjianten River, fifteen miles west of the two cities. During the last week of February, Blackburn and ter Poorten discussed the deployment of Black Force. Blackburn proposed placing his troops at either one of the two towns forward of the two cities the Dutch considered most vital: Tangerang, fifteen miles west of Batavia, or Buitenzorg, sixty miles west of Bandung. Ter Poorten approved the Buitenzorg deployment, and Black Force took position by 27 February. 150 miles to the south shore in only one week to cut the island in two. Inland of the central landing site the 230th Regiment made similarly rapid progress and by 7 March had taken Lembang, only eight miles north of Bandung. In the west the 2d Division probed Dutch defenses facing Bantam Bay. Finding a weak spot on the northern route, the enemy dashed fifty miles east and captured Batavia on 5 March. and tank, piled equipment and weapons on all available trucks and backs, and made their way twenty miles to a point east of Djasinga on the afternoon of 2 March. The next day they moved ten miles further east to Leuwiliang on the Tjianten River. As the Japanese closed on Leuwiliang, they came up against a more formidable strongpoint than those encountered earlier, a position anchored by the three batteries of 2d Battalion, 131st Field Artillery. A proud National Guard unit recruited from the north central Texas communities of Abilene, Decatur, Jacksboro, and Wichita Falls, the 2d Battalion had entered federal service in World War I as part of the 36th Division. Reverting to National Guard status after the war, the unit was recalled to federal service on 25 November 1940 under the command of Lt. Col. Blucher S. Tharp. One year later the men of each battery, parading through cheering throngs of friends and neighbors, boarded trains for the West Coast. Other battalions of the 131st had also been federalized, but only the 2d Battalion had achieved combat readiness. defenses of Australia, while the 2d Battalion, 131st Field Artillery, boarded transports for Java, arriving at Surabaja on 11 January. Meanwhile, General Wavell decided to post the two battalions of the 148th Field Artillery to Timor as soon as shipping became available. On 15 February, the 148th finally embarked aboard transports escorted by the cruiser USS Houston and destroyer USS Peary, but the convoy came under intense Japanese air attack in the Timor Sea and returned to Darwin. Thus, the 2d Battalion of the 131st Artillery was the only United States Army ground unit in the fight for the East Indies. After a two-day retreat, Colonel Tharp's batteries deployed on the east side of the Tjianten River and on 3 March began firing west on advancing Japanese forces. Blackburn and his American artillerymen held the enemy before Lenwiliang for two days, enough time for the Allied garrison at Batavia to escape within Black Force lines. On 4 March, with the 230th Regiment closing fast from the east, General ter Poorten decided to abandon Batavia and Buitenzorg and concentrate his forces around Bandung. Black Force with its American artillery unit held the Leuwiliang line during the day, then withdrew ten miles to the edge of Buitenzorg. The next day Black Force and stragglers withdrew east through Buitenzorg and continued over twenty miles farther to Sukabumi, where they set up their last organized defense. 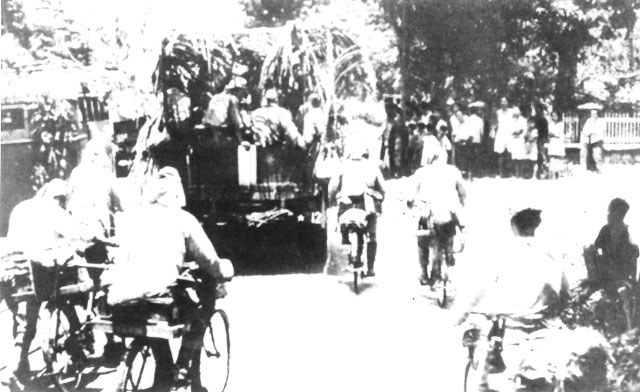 On the 6-7 March, Black Force broke down into components and escaped into hill masses south of Bandung, but within days the Japanese rounded up all survivors. On the morning of 8 March, ter Poorten issued his surrender order over enemy-controlled radio. Out of ammunition and low on rations and water, Tharp had no choice but to comply. The Japanese counted 541 Americans and several thousand other Allied prisoners, then marched them all to Batavia. After holding the Texas artillerymen for seven months in what became known as the "Bicycle Camp," the enemy shipped the Americans and thousands of others to northern Burma. There the exhausted prisoners spent the rest of the war in heavy labor gangs working on the Burma-Thailand railway with little food and frequent beatings. The severe conditions reduced all to a state of diseased malnutrition, fatal to many. Out of touch with Allied units, the 2d Battalion, 131st Field Artillery, became known as the Lost Battalion. For three and a half years after the surrender of Java the people of north central Texas joined the nation in the long and anxious wait for victory over the Axis. Uppermost in the minds of many, however, was the liberation of their Lost Battalion. That moment finally arrived in 1945 when victorious Allied armies broke down the gates of prisoner of war camps in Thailand. There they found three hundred survivors of the missing artillery unit. As the soldiers recovered from the ordeal of captivity, the men of the 131st learned their service in Java had not gone unnoticed. President Harry S. Truman had awarded the battalion a Presidential Unit Citation, and the War Department had declared the battalion's fight on Java part of the Army's first official campaign after the Japanese attack on Pearl Harbor. The experience of 2d Battalion, 131st Field Artillery, and the loss of thousands of Allied soldiers, sailors and airmen in the East Indies stands as a depressing reminder of Allied unpreparedness in the Pacific in 1941. Despite the stopgap and reactive nature of most ABDA operations during the campaign, a number of valuable lessons emerged at both the operational and tactical levels. ABDACOM gave the Allies a valuable experience in coalition warfare that would apply not only in the Pacific but to other theaters as well. New procedures in alliance functions offered the hope that some of the more difficult problems of international operations might be avoided. At both the operational and tactical levels, ABDACOM departed from normal Allied military practices. First, a unified command under one officer answered to a binational committee of military chiefs rather than to one of the participating governments. Second, two powers--Britain and the United States--made decisions for five powers on the assumption that the others would recognize the benefits and approve. In establishing ABDACOM, British and American political and military leaders presumed to speak for Australia, the Netherlands, and Nationalist China, although none of the three had attended planning sessions and the last was not expected to contribute forces. Japan. In the field, on the ground, in the air, and at sea, similar arrangements created a welter of ad hoc multinational task forces at the tactical level. Their notable lack of success--due more perhaps to a lack of combat strength and planning time--militated against similar command arrangements in the future. In the end, ABDACOM could do no more than slow Japanese aggression in the early stages of the war. Although its lack of resources may have made success impossible, its multiple missions illustrated the difficulty of controlling multinational forces with varying priorities. henceforth the war in Asia would be managed on a bilateral multitheater basis. In 1942-45, the American-Australian victory in New Guinea, the Anglo-American victory in Burma, and the Sino-American successes in China all owed much to the joint planning and opal experience gained during the brief life of ABDACOM. The continuous retreat by one artillery battalion seemed to hold no lessons for the U.S. Army. Yet analysts who could look beyond the limitations of events on found things of value for future Pacific operations. The Japanese had given the U.S. Army a stunning demonstration of simultaneous large-unit amphibious landings thousands of miles from the home islands, followed by a mechanized blitz in a jungle environment. These techniques lay well within the capability of the U.S. Army, for a rudimentary doctrine, based on prewar maneuvers in the Caribbean and Panama, already existed. More troubling, however, the Japanese had shown impressive skill at night operations, and in so doing highlighted a major deficiency in U.S. Army tactical capabilities. For American troops the prospect of extensive night fighting was almost as unnerving as that of facing the fanatical Japanese soldiers. The U.S. Army had not, in fact, attempted large-scale night movement since the Meuse-Argonne offensive of 1918. The Army would have to either develop competence in this realm or find a way to avoid it. In it eight-day retreat on Java, the 2d Battalion, 131st Field Artillery performed well. In occupying a succession of defensive positions, the American artillerymen proved adept at withdrawing successfully under pressure, one of the most difficult tactical maneuvers in warfare. When the momentum had shifted in the Pacific later in the year, hundreds of other artillery battalions would have to carry out a similarly rapid succession of redeployments on many other island while advancing rather than retreating. At the tactical level, in fact, in both the European and Pacific theaters of war, American artillerymen rapidly earned the respect of their adversaries, validating much of the U.S. Army's prewar artillery doctrine and training techniques. An exhaustive account of the East Indies Campaign in the English language, including U.S. Army participation, can be found in the Australian official history of World War II: Lionel Wigmore, The Japanese Thrust (1957), especially Chapters 21 and 22. H. P. Willmott, Empires in the Balance (1982) provides a detailed account of the fight for Java, particularly in Chapter 12. Hollis Glen Allen recounts the experiences of 2d Battalion, 131st Field Artillery in the privately published "The Lost Battalion" (c. 1963). A copy of this work may be found the New York City Public Library. Elmer Ray Milner devotes several chapters on the Lost Battalion in his doctoral dissertation, "An Agonizing Evolution: A History of the Texas National Guard, 1900-1945" (1979). After their liberation, Lost Battalion survivors were interviewed about their treatment in prisoner of war camps. Transcripts of these interviews are located in Record Group 407 of the National Archives and Records Administration, Washington, D.C.